Kavzinc, 1921. Source: OAO Electrozinc.The story of Vladikavkaz’s Electrozinc plant goes back to the Russian Empire. It was the first place in Russia to produce electro-plated zinc on an industrial scale, and later it became the flagship of the USSR’s mining and metallurgy sector. But large scale production in Vladikavkaz has inevitably been accompanied by toxic emissions. Ecologists started to raise alarms in the late 1990s: a combination of clapped out equipment and obsolete technology threatened to turn not just North Ossetia into a chemical waste dump, but neighbouring republics in the North Caucasus as well. Despite the fact that toxic atmospheric emissions have been documented on many occasions, and the protests that have arisen around them, the plant is still in operation. It took until 2016 for the plant’s management to announce it was closing down its zinc production and clearing the accumulated industrial waste for the first time in 70 years. As Alina Bigayeva points out, Electrozinc is also North Ossetia’s largest taxpayer and investor, contributing around $5.4m to the republic’s budget in 2017. I spoke to Atsamaz Khadikov, one of the leading activists in the fight for environmental protection in North Ossetia, about the prospects for the region’s ecology. A doctor by profession, Khadikov took part in a Prosecutor-General’s Office inspection of the plant in 2005. How long has this plant been in operation? Electrozinc has been operating under its present name since 1934. It was previously known as Kavzinc and used local raw materials, but in 1934 it began to use imported raw materials from 40 countries. It is still doing this, although they don’t admit it and insist that their raw materials are all mined locally. “Elektrocadmium” would now be a much more appropriate name. Are the plant’s operations ever inspected? In April 2017, the plant’s management refused entry to its premises to the well-known environment expert Alexey Kiselev and Sergey Tsiplenkov, the head of Russian Greenpeace. They were instead shown an exhibition on the history of the Gulag and then taken to a regional government meeting about unsafe housing stock. Tsiplenkov himself told me that they only managed to request that documents relating to the plant be sent to them in Moscow. It took a month and a half for anything to arrive, and another two months before we could talk about them. I asked what raw materials were being used at the plant, and it turned out that for the last few years they have been reprocessing radioactive concentrates from South Africa. Atsamaz Khadikov. Source: Facebook.We reported this to Mikhail Fedotov, who heads the Presidential Council for Human Rights and the Development of Civil Society, and he was supposed to pass the information on to President Putin. But back in 2010, in a conversation with the then head of North Ossetia Teymuraz Mamsurov, Putin asked whether the Ural Mining and Metallurgical Company (Electroczinc’s mother company) would be coming into operation? What could Mamsurov answer? Of course he said yes. We were protesting actively back then. The plant’s management insists that the waste issue is under control. What’s the real situation? At the end of last year, an air quality monitoring system called “SKAT” was installed in Vladikavkaz. I, along with other people involved in environmental and consumer rights organisations, was invited to the opening ceremony, which was recorded on video and by the local TV channel. I also spoke for some time, and asked, among other things, why the air monitoring instruments weren’t the same as those in operation in Moscow. Boris Revich, a world-class environmental specialist from Russia’s Academy of Sciences, explained that the local instruments weren’t up to scratch, especially for a city with such serious environmental pollution issues. The equipment used in Moscow is a western import that has passed “Eurotest” system scrutiny and other checks. But Vladikavkaz nonetheless decided to install the “SKAT” system, despite Revich’s advice to the contrary. Over the last few years we in North Ossetia have had regular visits from various medical specialists – cardiologists, neurologists, endocrinologists – but none from toxicologists. And for some reason doctors don’t ever admit that the symptoms displayed by the local population look like the results of poisoning. Why has the Russian Ministry of Health’s chief toxicology specialist never visited us? It seems rather odd. How has pollution from the plant changed over the recent years in terms of its effect on people’s health? In 2007, Electrozinc commissioned specialists to collect blood samples from children living in North Ossetia, but the results were hushed up to avoid compromising the plant’s owners. They wanted to shrink the controlled access area around the plant to a radius of 300 metres, although most similar installations have a controlled radius of one kilometre, and 15-20 years ago it was two kilometres. A few years ago the plant’s laboratory decided to recultivate the ground around nursery schools. They began looking for suitably safe soil all over the republic, and indeed didn’t find any that wasn’t polluted by heavy metals. This served as the basis for an announcement by the planet’s CEO that what we had was a high background pollution level. He didn’t, however, mention the fact that the highest levels of pollution were next to the plant and the mining and enrichment works. But they were working without observing hygiene and environmental norms. The whole world brought us their waste for years, and now they put everything down to “high background pollution”. That is a flagrant lie. Installation on Nikolaev St., Vladikavkaz. Source: OAO Electrozinc.There’s can’t be any objective figures for Electrozinc because there is practically no environmental monitoring service. There are structures that carry out management instructions to hide everything that has to be hidden and tart up everything else. I think the people who work in these structures get extra benefits on top of their salaries. Local doctors, unfortunately, keep their mouths shut, because they can lose their jobs. And they’re not the only people reliant on the plant. If you wanted to appoint staff who would be independent of management, you would have to fire the chiefs of every public body. What can you say about recent announcements about an alleged drop of 80% in toxic discharges over the last 13 years? In October 2016, the plant management announced that, in the interests of environmental improvements, they had closed down the most toxic process – lead production. But at the same time they have increased production of zinc. Besides producing 80% of Russia’s lead, Electrozinc also produced 40% of its cadmium, although this is more than 60 times more toxic than lead. We have more of it in our bodies and our environment here than anywhere else in Russia, and it is considered even more toxic than mercury – in other words, it is the most toxic metal of them all. How can you find out whether someone has been poisoned by toxic waste? Many people imagine that I’m an ecologist, but in fact I’m a doctor, so my main concern is the symptoms that people have. Even in people with other serious conditions, the first thing I notice is chronic cadmium and arsenic poisoning. In international classification, arsenic is considered a Group 1 carcinogen that is particularly dangerous to skin and lungs. And cadmium carries the same classification for its effect on the kidneys and prostate gland. There are also figures to show that higher cadmium content in the body increases the risk of mammary gland disorders by 21%. In the 1980s, most complaints were about throat infections – a sign of sulphur dioxide in the atmosphere. Now the symptoms are different: a metallic taste in the mouth, a drying out of the mucous lining in the nose. And this suggests an increase in arsenic levels. These metals all have a cumulative effect – their effect on the body increases with time. So symptoms of poisoning can develop even 30 years after a person has worked with these metals. What medical conditions are most common in North Ossetia now? Skin cancer. Our oncology clinic is always full to overflowing. Its director once gave an interview, and you know what she said? Our people, she claimed, spend too much time in tanning salons. I have never met anyone, woman or man, who was diagnosed with skin cancer after using a sun bed. The late ecologist Alexey Yablokov used to say that the North Caucasus had the highest incidence of cancer in the whole of Russia, and North Ossetia had the highest incidence of six kinds of cancer. He, by the way, referred to Electrozinc as a cadmium factory, after its main toxic waste product. What generalisations can you make on the basis of these discharges of toxic waste products into the environment and their effect on people’s health? There are figures that show that in 1985 there were 67.5 tonnes of toxic waste discharged, and in 2005 only 2.5 tonnes – 27 times less waste for the same level of production. Fantastic, eh? And now they tell us that waste levels are down to 800 tonnes. Well, for that, every worker, as well as the CEO, should be awarded the Nobel Prize and have gold monuments erected to them. Seven or eight years ago we asked the Ministry of Health for information on the incidence of various conditions (and sometimes I could get hold of figures through unofficial channels). And here in North Ossetia, the incidence of respiratory conditions is statistically 20 times higher than the Russian average. Embankment of the Terek. Source: Wikimapia.Two years ago, three people died of flu and 13 of complications from it. Neither antiviral nor antibiotic medicines helped. And it was only in Ossetia that people died. Why did no one die anywhere else? What is this flu that only kills residents of North Ossetia? We have a sick joke that’s been doing the rounds for a while: “You’ve got a gas chamber in a concentration camp. They carry one lot out, dead, then another lot. But there are four inmates still sitting inside, playing cards. Somebody asks them: ‘Where are you from? How come you’re not dead?’ And they reply, ‘We’re from Electrozinc, we’re used to it.’” That joke is 40 years old. Does the plant’s work affect neighbouring republics? Of course. The rivers flow down from here. A few years ago we had a flood, and that got the ecologists from our neighbours, Chechnya and Ingushetia, worried. They could see the effects – the fish started dying off and cattle were falling sick. And even they could tell us that it was because of so-called tailing ponds – places where several million tonnes of waste from mining and enrichment works would accumulate. We poison people in Ingushetia through both air and water. There’s a small river there, the Kambileyevka (a tributary of the Terek) that is considered the “deadliest” river in Russia. In May 2006, the zinc content was recorded as 898 times the normal level and the copper, 71 times the norm. In September of the same year, however, zinc levels were recorded as only 12 times the norm, which was odd, but production levels at the plant hadn’t changed over that period. In other words, staff were told to record a much lower figure. A friend of mine who lives there says that nothing will grow near that river. The number of cattle has also fallen – they drink the river water. And locals are often diagnosed with cancer. In Dagestan there is a professor called Gayirbek Abdurakhmanov. He wrote in 2013 that there had been a 2000-fold increase in the zinc ion content of the waters of the Terek River in Dagestan. I was a conference in Makhachkala (the capital of Dagestan) two years ago, and asked whether there had been any improvement. What percentage of Dagestan is washed by the waters of the Terek, I asked, and was told that it was 30% of the whole republic. They hadn’t, however, measured the quality of the water. There is an Institute of Water Problems, which looks after the Volga. But no one is taking any notice of the Terek, although it is 600 kilometres long. We have two mining and enrichment works, neither of which is operational now. But when there was a flood in the Phiagdon Gorge five years ago, something was washed down with the water and all the fish died. And these dead fish were carried downstream as far as Chechnya. You’re very informed about what’s happening at Electrozinc, you often organise protest action. But there doesn’t seem to be any mass movement against the plant. Why do you think this is? I inspected the plant for a month and a half in June 2005, and really got involved in it. I live just a kilometre from the place. When I go out onto my balcony at night I can hear it working. I don’t understand why people here are so passive. In Sochi, environmentalists are campaigning around forests and dead trees. But here there are people dying, and nobody is doing anything about it. A lot of people don’t realise how harmful it all is. People get the idea that everything is fine, even though many of them have cancer or diabetes. And they start believing, like people back in the superstitious Middle Ages, that it’s all a kind of voodoo, the evil eye and so on. Some of them are even well educated. 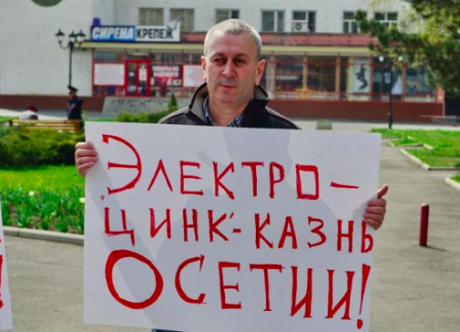 Residents of North Ossetia live under the weight of years-long disinformation. They look at the government, which tells them that everything is just fine. They have TV, which from time to time shows them positive stories about various ways of avoiding illness, about healthy environments… The mountains of Ossetia are beautiful to look at – that’s true. But their beauty is deceptive. 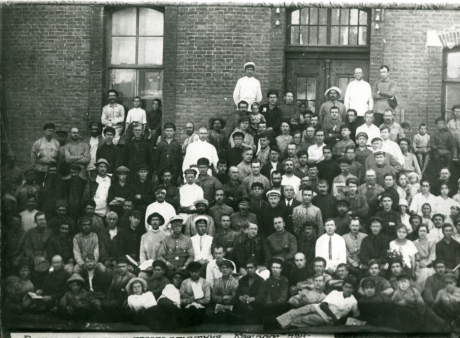 The whole republic was full of factories – there were more than in any Russian city. That had to have consequences. Our generally low level of environmental awareness is a result of our being told for decades that everything was safe. 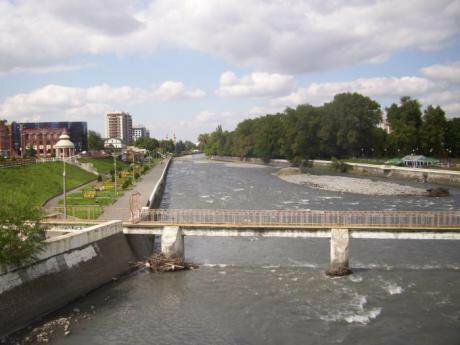 People in Vladikavkaz go for walks to the banks of the Terek. There is a park there, and a funfair. But everyone knows that most of the waste from the plant settles on the riverbank (a result of differences in temperature). It was always thought that living beside the river was an elite kind of thing to, and the flats are more expensive there. But the reality is the opposite. At the same time, we associate the Caucasus with pure mountain air, and open air leisure is being actively promoted. So are you saying that it’s not such a healthy environment as people think? Yes, people always associate the Caucasus with mountains, green grass and clean rivers. But none of that applies to Ossetia, Ingushetia or Chechnya. There might be a few unpolluted spots somewhere, in a more remote area, but in general everything is seriously poisoned. But surely some government figures are talking about the harm caused by industry? Well, yes, occasionally Duma deputies show some signs of activity and talk about the harm caused by Electrozinc – usually before some election or other – or someone who’s had a family member die of cancer will speak out. But nothing ever changes – this activity seems to be just an act. The last time the parliamentarians of North Ossetia paid any attention to the Electrozinc problem was at the beginning of this year. A committee, headed by well known local politician Djambolat Tedeyev, was set up to assess the environmental health of Vladikavkaz. So far, there has been no news of any progress. Meanwhile, there was news at the end of May that the reconstruction of the plant’s sulphuric acid facility, built in the 1980s and long past its sell-by date, is almost complete. The part of the plant responsible for the highest level of air pollution will soon be back in operation.